Hardly anyone can afford an original Claude Monet painting. Many of his originals aren't even for sale. 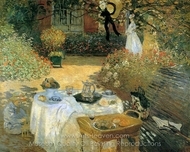 Many famous Monet paintings are displayed at the finest museums around the world, because many art historians consider Monet the founder of the Impressionist art movement, which saw its heyday in Paris from 1870 to 1880. 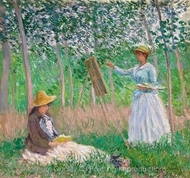 Monet paintings show the true idealism behind the 19th century impressionism art period, with painting techniques that capture the mind and leave an indelible "impression" -- hence the movement's name. 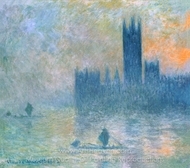 Any art collection is not complete without a Monet on display, so how do you get your hands on one? 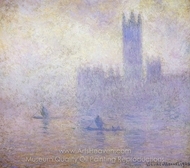 Purchase one of the many Monet reproductions painted by Impressionist expert artists employed here in our studio. 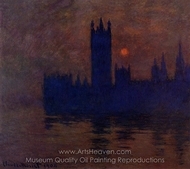 The Impressionism movement got its name from Claude Monet when he named a painting of his Impression Sunrise. Monet glanced at Le Havre harbor early one morning, and set about to put his "first impression" of his view onto canvas. 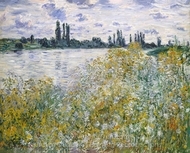 Claude Monet famous oil paintings all mirror the technique he used in his work: a dreamlike use of color and blended brush strokes that place the viewer admiring the painting into an almost catatonic state. 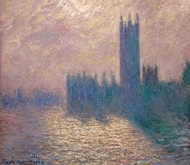 Viewers cannot look away from a Monet, because the detail is almost too subtle to be detailed, leaving the viewer wondering how Monet achieved this in his art. Famous Monet paintings include Impression Sunrise, the Water Lilies series, and numerous portrayals of landscapes and human subjects. 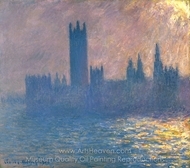 Many marvel at the Monet oil paintings on display at museums and art exhibitions; many more desire a Monet on their living-room wall. 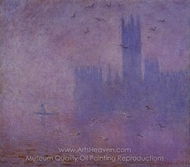 This is where museum quality Monet reproductions come into play. 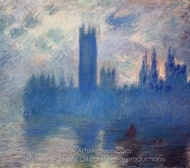 Claude Monet paintings on canvas add a subtle, yet thought-provoking touch to any home wall decor. His paintings blend color with substance, leaving the viewer entranced by Monet's brilliant use of color to actually form the shapes displayed in the artwork, no harsh lines or borders here. 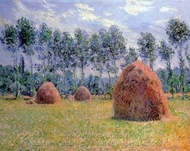 Monet famous paintings represent one of the true visionaries of the Impressionist art period, and also who some consider to be greatest artist out of that time. 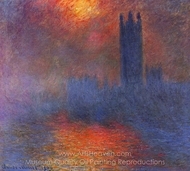 A quality Monet reproductions, when done right, give art collectors the beauty and influence of Monet without the price tag. Here we employs Monet specialists who can create oil and canvas into Claude Monet famous paintings that any art collector can proudly display. 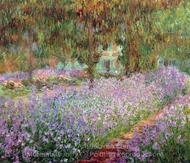 Fill your wall space with Claude Monet's beautiful paintings that capture the essence of impressionism. 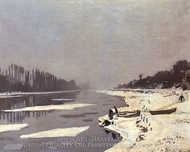 Some of the famous paintings on display in museums show Monet's true intent when he began to paint in this style in the 1800s. 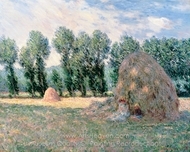 Monet believed that the only true impression was a first impression, a style displayed in many well-done reproductions, as well. People visiting your home can only marvel at the first impression they will receive viewing one of the breathtaking Monet reproductions on canvas.